Sayulita's most beautiful Oceanside estate property! Free wireless internet and laundry . Casa Mikayla in Sayulita is located at "Villas Rana Verde", Sayulita's premiere estate property on a beautiful gently sloped hillside with 360-degree views of the ocean and jungle, and only 75 yards from the ocean, in a tropical paradise in wonderful, sunny Sayulita! We are across the street from the ocean, just a 2 minute walk on cobblestone to the sand. We are in the exclusive "Pedregoso" neighborhood on the north side of Sayulita directly across the street from Casa Oso. There are 3 villas on the property, but each one is separate and private from each other. Each villa has its own private pool, gourmet kitchen, living area, gardens, etc. Nothing is shared between the 3 villas except for the free laundry, gated entry and cobblestone parking area. Our location is perfect for Events with capacity for 80 guests. Please view our Event Venue page. The house offers two bedrooms with three bathrooms and sleeps 4 adults with room for cribs and "chaise" beds for small children, and sits just slightly higher than our other villas, Casa Rana Verde and Casa Pajaro. Guests are assured tranquility and peace of mind during their vacation in this architecturally designed villa. We live right next door to the estate to insure that your vacation will be all you expect it to be. Make sure to view slide show of the panoramic ocean views and the incredible swimming pool in our tropical garden. Our driver can pick you up at the airport in an air conditioned Suburban stocked with cold drinks. Our cook makes the best Mexican food in all of Mexico! We offer any or all meals to your group. Everone loves our cook's fabulous meals. We provide high speed wireless internet and a free laundry that is solely for guests useage at no extra charge. We are located about 1/2 mile from the village in an area of private villas away from the all night noise of the village with its roosters, soccer field events and cantinas. Your quiet night of sleep is assured.The short 10 minute walk to town can be along the pristine, sandy beach or a dirt road. This fully-furnished home features ocean and jungle views from every room and one-plus acre of private, gated land. All rooms are furnished with the finest amenities such as Ralph Lauren towels, 400 thread count all cotton sheets, down and other comfortable pillows, Guatemalan fabrics for all curtains and pillows, furnishings that will allow you all the comforts you need while enjoying our incredible villa! Our kitchens are fully stocked with as many small appliances, frying pans, wine glasses, coffee cups, plates, bowls, utensils, etc. as you have in your own homes. Everything in the kitchen is in abundance. All the kitchenware is matching Fiestaware, matching high quality flat ware, hand loomed Guatemalan and Mexican all cotton napkins, everything the best!. The beach across the street is one of the most pristine, sandy, private beaches you have ever seen, with the cleanest water in Sayulita. There is great surf fishing on the beach right in front of the estate. The fisherman regularly catch snook, sea bass, grouper and many other varieties. It is not unusual to be the only person on the beach for 1/4 mile in either direction. It is a nesting grounds for Leatherback turtles who can be seen in the early morning and late evenings hours during the summer months laying their eggs or hiding the nests before their return to the ocean. Remember many villas discourage children, but we cater to kids, we have cribs (2) and (2) highchairs, so no need to rent them. We have babysitting services available from our Mexican family of over 14 years, who are really part of our family. Our driver has multiple childseats for the trip from the airport. The best tropical garden in Sayulita is at your doorstep with private, gated grounds that feature over 20 varieties of palm trees, plumeria trees, many varieties of hibiscus, many varieties of bouganvilla, sweet jasmine everywhere, birds of paradise, gardenia, corona, maguey, abundant catii, almond trees, jamaica, bananas, papayas, Mandarin oranges, Persian limes, orchid trees, and much more. Meander through our cobblestone pathways into a tropical botanical paradise seldom seen on private grounds. If you love to garden, this is a once in a lifetime opportunity to live in the midst of nature! Our lovely estate is home to the most beautiful birds that you are likely to witness outside the most complete aviary of exotic, tropical, colorful birds! We have identified over 100 varieties of these magnificent creatures! Without even leaving the estate you can view hummingbirds, orioles, tanagers, caciques, finches, parakeets, parrots, woodpeckers, chachalacas, trogons, hawks, honeycreepers, warblers, and much, much more. There is an even larger abundance if you venture into the nearby jungle. This is a truly unsurpassed bird-lovers delight! Our other homes Casa Rana Verde and Casa Pajaro are also on the estate. All 3 villas can be rented together with 7 bedrooms, 10 baths, 3 kitchens and 4 pools for a great wedding celebration, extended family or multi family vacation, holistic retreat or vacation camp! 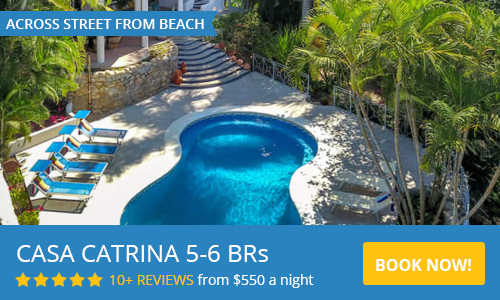 We have the best home, pool, garden, location, views and amenities in Sayulita and thus can offer you one of the best Sayulita Mexico vacations available! No matter how beautiful you imagine our estate to be, when you get there it is twice as beautiful!! ....That really sums up my families (of 4) week stay at Casa Mikayla! We knew we wanted a place close but not too close to town; this place was that and so much more!! A beautiful property 5 mins from town. The owners were so friendly and helpful in ensuring we had a flawless trip. We went with their recommendations and had their driver pick us up from the airport. Angel was right on time. After a long day of flying, we arrived to a homemade Mexican Feast ...My 2nd fav part = zero clean up. The food was SO good our family was snacking for days. During our stay we reached out with a few special requests. Barry was awesome and went above and beyond our expectations. The property is surrounded by lush green palms, plants and trees. Super comfy beds and AC in both rooms. Private clean pool. Everything provided in kitchen you need. Having a washer/dryer nearby was much appreciated! In the evenings and mornings all you hear is the sound of the wind blowing through the trees and the sound of waves crashing. From certain areas of the property you are able to see a panoramic view of the ocean. It was magical. We visited a number of different beaches during our stay and the beach across the street was by far our families favorite...You really felt as though you were on your own private beach...especially during the morning/evening hours. Our kids also had a blast cruising around town in the golf cart we rented during our stay. Also definitely check out the owners store in town, Gypsy Galleria. Really cool stuff, great for gifts and souvenirs. Thank you so much to the owners for everything - we will see you again soon! If you're searching for the perfect spot, this is the place! You will not be disappointed. We had our wedding at Villas Rana Verde and rented out the entire property for a week vacation. We were able to hold the rehearsal dinner, wedding ceremony, reception and the bridal brunch on the property. There were 21 people staying there and we had 50 guests at the wedding and still had SO much room. Each casita has their own private area that it was easy to have individual privacy and shared fun on the property at any time. We stayed up late for the wedding and played music and laughed all night and were able to not disturb any of our members that wanted to go to sleep earlier in the evening. The groundskeeper was awesome, he was always available to help whenever we needed it. The staff was wonderful and Barry and Connie were warm and wonderful and super attentive. The walk to the beach was short and BEAUTIFUL down a beautifully paved path and the trip into town was so easy and fun with our golf carts. I picked this place randomly, having no experience with the property, and was able to hold a wedding and a group vacation that people are STILL raving about. I have recommended this place to others, plan to revisit in the future and stand by it 100 percent. Stay here. You won't regret it! So great to have you stay with us! Your group was amazing! I told when you called that weddings are very special to us and we really make an extra special effort to make each one as wonderful as possible. It is so rewarding when we have guests like you! Thanks again! The place is first class. We had 21 family members stay at all three villas on property. The attention to detail was impeccable from the architecture and decor to the landscaping and views. Absolutely amazing! Its just far enough from the center of town to escape the noise and bustle yet close enough to walk in everyday, even for our three and five year old boys. The beach is just a 2 minute walk down a beautiful stone stair trail. I highly recommend having a meal prepared at the villa because its the best "restaurant" in town. Also worth mentioning was Barry's exchange rate was the best we could find and his knowledge of the ins and outs of Sayulita made us feel safe and confident as we embraced this beautiful little town. Its was truly a magical vacation and we are already planning our return. So stop searching for a place to stay and book this villa today, you will not regret it. Our family and two other families spent almost a week in all three of the villas. Barry and Connie were excellent hosts. Our large group loved having the entire property with all three villas to relax and enjoy. The sunsets were amazing with the beach views. The location is great, and we rented golf carts to get out and about quicker, but most times we easily walked where we needed to go. Beach access was a very short walk from the villas. There were plenty of beach towels, and we loved having chairs, umbrellas, and boogie boards to borrow. Sayulita is such a safe feeling place, and we felt comfortable letting our older teens adventure by themselves as a group which they loved. The properties themselves are very well taken care of. The rooms are very clean, and Lucia and her helpers did a great job everyday keeping things so nice. The grounds are also very well taken care of. Chuy does a great job. It feels like you are at a huge resort with how nicely things are taken care of and the variety of plants. I can't say enough great things about the properties themselves. We have stayed in Sayulita several times before and this was hands down the nicest place, with the best amenities we have stayed. I especially loved how it was very Mexican feeling with the colors and tile work. We stayed in a home there a few years ago, and although it was nice, it felt like any other place I had been. These villas truly are unique. I think everyone in our group would agree that one of the best things about our stay was having Lucia cook several meals for our group. She is extremely talented. The homemade tortillas, guacamole, pico de gallo, not to mention her garlic shrimp, chile rellenos, enchiladas and the list go on and on, were amazing. It was so nice to all eat together as a group. Having her cook for us was a special treat and a highlight of the trip. If you need a nice place to stay in Sauylita, I would consider these properties. We plan to come and stay again in the future. Our family stayed at Casa Makayla for 8 days and had a positive experience. Barry, the owner, is very responsive and helped connect us with local services which we found helpful. One of his contacts, Angel, provided reliable transportation to/from the airport as well. The two master suites are large enough to be comfortable and decorated nicely with local touches. There are ocean views from every room on the property, the sunsets from the upper level suite are amazing. The pool was great late afternoon to cool off and refresh. The beach, a 5 minute walk, is very quiet and clean. If you want a busier area, then you can head into town for surfing, local shops and restaurants. We do recommend a golf cart as town is about a 5 minute drive or a 15-20 minute walk one way. Our teenage daughter speaks Spanish conversationally, unlike her parents, and we found that helpful in Sayulita in general. The town itself if much more of a local feel so if you want a more authentic trip, this is the spot; there are no big hotels or luxury resorts. We tried several restaurants and found them generally to all be very good - especially liked Medusa, Al Bacaro and Café Esperanza. And, if you are traveling from the US, your dollar will go far right now. Depending on how much you drink, we are light drinkers, meals for 4 out ranged from $25 to $50 for all of us. Our family surfed, boogie boarded, explored the town and went scuba diving which are all nearby. Oceana handled our scuba trip and we would recommend them - they also do snorkeling trips. Overall, good experience and you will find Barry easy to work. He also lives next to the property unlike many who have rental agencies. Our family of three arrived in PV on 3/11 and was picked up by Angel, Barry Dumont's driver. Very professional arrangement and he stopped by the grocery store and stocked up for the week. Once we got to the casa we found a fantastic setup. Very well maintained and close to town this is a real jewel. Everything worked and was very clean. Comfy beds and very fluffy towels. We had a fantastic view from the second floor balcony and anything we needed Barry was very attentive and communicated well. Our nine year old son loved the private pool and the wonderful folk art decorations. We can't recommend the property and host enough. If you're looking for a great experience in Sayulita this is it. Our family of 6 rented Casa Mikalya and Casa Pajaro, two of three villas in a shared compound. The homes were quite comfortable and colorfully and charmingly decorated with artisan craft items, handprinted tiles, etc. The owners live next door and are friendly and helpful. They were incredibly responsive both before and during the trip with advice and suggestions; they arranged our transport, lined up a fantastic surfing guide and a delicious Mexican meal upon arrival. The beach is a very short walk away and town is close enough that you can manage without a car as we did, though next time we will rent a golf cart. The views are lovely and the jungle setting very atmospheric. We loved it! We stayed at Casa Mikayla and Casa Rana Verde. It was perfect for our group. Great location, awesome pool, fun neighbors, lots of bedding options - and Lucia & Chuy are the best ever. Definitely have Lucia cook for you at least one night (mole & chile rellenos & ceviche & enchiladas were our favorites). She cooked for 20 people one night at the house and it was awesome. Barry the owner is very helpful as well. Will definitely stay there again next time I go to Sayulita! My wife and I just spent a week at Casa Mikayla. We now realize that our next stay will have to be longer because we enjoyed ourselves so much. The villa is beautifully decorated and the views are fantastic. Each villa is a wonder to look at with cobblestone and tile drive and walkways. It is only a quick walk to town and an even shorter walk to the beach. We had a fine meal prepared by the home cook on our first night and the restaurants in Sayulita served wonderful dishes along with good service. Casa Mikayala is a great place to stay and Sayulita a fun vacation spot. 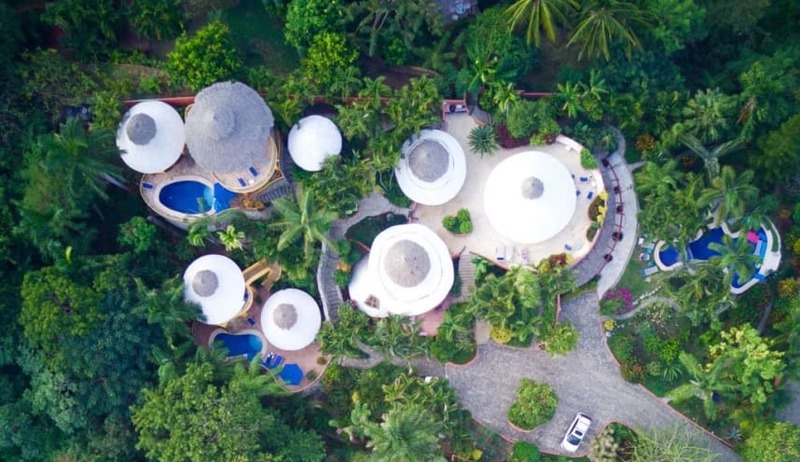 30% off Casa Mikayla, Sayulita's finest property 3/30/19-4/25/19. Panoramic ocean views! 2 minutes walk to the sand! Contact us via the form and we look forward to assisting you and welcoming you to Sayulita!